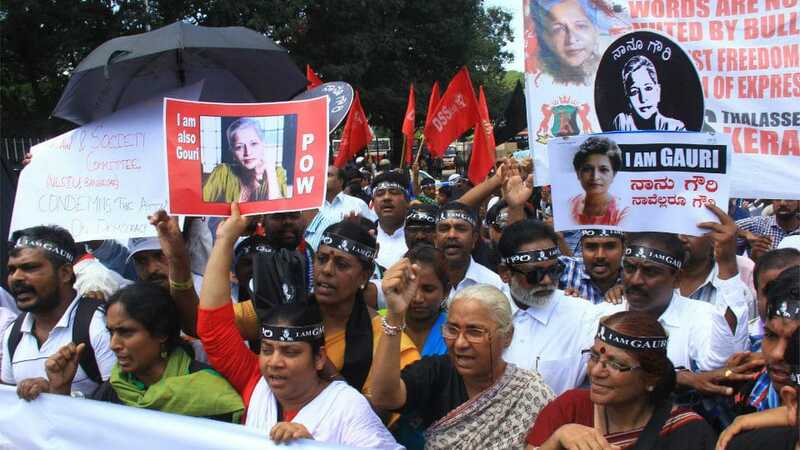 Bengaluru/Mysuru: Thousands of activists from various parts of the State and Country held a mammoth protest rally against the killing of journalist Gauri Lankesh, here this morning. The protesters, including writers, journalists, rationalists, who assembled at the Sangolli Rayanna Railway Station, took out a rally till the Central College Grounds, sporting black bands stating ‘I am Gauri’ and demanding for the arrest of those responsible for her killing. Activists, writers like P. Sainath, Teesta Setalvad, Anand Patwardhan, Kavitha Krishnan, Prashanth Bhushan, Medha Patkar, Megha Pansare and others are expected to address the public rally to be held at the Central College Grounds. 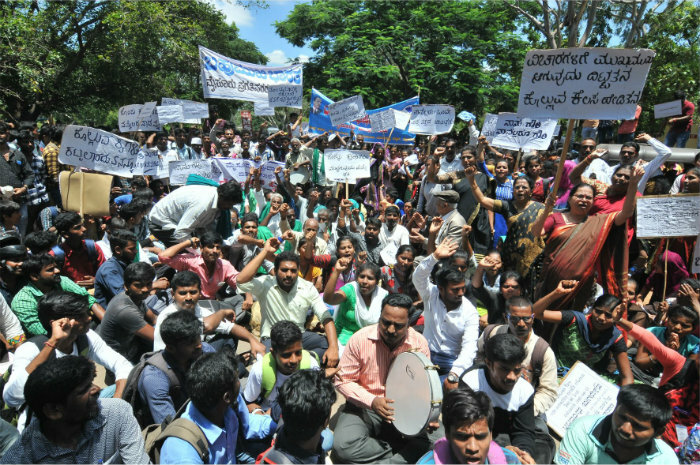 Similar, protest rally was also held in Mysuru where more than 1,000 people, comprising writers, retired Professors, students of various colleges and others took out a rally condemning the killing of Gauri Lankesh. The protesters urged the State Government to expedite the probe and arrest the killers. They wanted to handover a memorandum to Deputy Commissioner D. Randeep. As the DC was attending a meeting in Zilla Panchayat, Assistant Commissioner Shivegowda came to receive the memorandum. But the protesters insisted on the Deputy Commissioner to arrive at the spot. Police personnel had a tough time to manage the surging huge crowd. Theatre critic Muddu Krishna, Prof. Kalachanne Gowda, Prof. Vasanthamma, Prof. Sarvamangala, DSS District Convenor Bettaiah Kote, Advocate Sumana and others were present. ನಡೆದಿದ್ದು ಗೌರಿ ಲಂಕೇಶ್ ಹತ್ಯೆ ಪ್ರಕರಣದ ತನಿಖೆ. ಆಗ ಸಿಕ್ಕಿದ್ದು ಶಾರ್ಪ್ ಶೂಟರ್ ತಾಹಿರ್ ಹುಸೇನ್ ಎನ್ನುವ ಮುಸ್ಲಿಂ ಹುಡುಗ. ಆತ ಕೈ ತೋರಿಸಿದ್ದು ಶಶಿಧರ್ ಮುಂಡೇವಾಡಿ ಎನ್ನುವ ಸುಪಾರಿ ಹಂತಕನ ಕಡೆ. ಆತನ ಗುಂಡಿಗೆ ಬಲಿಯಾಗಲಿದ್ದವನು ಸುನೀಲ್ ಹೆಗ್ಗವರವಳ್ಳಿ ಎನ್ನುವ ಪತ್ರಕರ್ತ. ಅವನಿಗೆ ಸುಫಾರಿ ಕೊಟ್ಟಿದ್ದು ಗೌರಿಯ ಅಪ್ಪ ಲಂಕೇಶ್ ಮೇಷ್ಟ್ರ ಶಿಷ್ಯ ರವಿ ಬೆಳಗೆರೆ. ರವಿ ಬೆಳಗೆರೆಯ ಪರ ವಾದ ಮಾಡಲು ನಿಂತಿರುವುದು ಕಾಂಗ್ರೆಸ್ ಪಕ್ಷದ ದಿವಾಕರ್. ಬುದ್ದಿಜೀವಿಗಳು ಬೆರಳು ತೋರಿಸುತ್ತಿರುವುದು ಬಲಪಂಥೀಯ ಸಂಘಟನೆಗಳ ಕಡೆ! ಅದು ನಿಮ್ಮ ನಿಮ್ಮಲ್ಲಿ ನಡೆಯುವ ಆಸ್ತಿ ವಿಚಾರವಿರಲಿ,ಕಮೀಷನ್ ವಿಚಾರವಿರಲಿ,ಹೆಣ್ಣಿನ ವಿಚಾರವಿರಲೀ,ವೃತ್ತಿ ವೈಷಮ್ಯವಿರಲೀ…ಯಾವ ವಿಚಾರಕ್ಕೆ ಬೇಕಾದರೂ ನೀವು ನೀವೇ ಹೇಗಾದರೂ ಹೊಡೆದಾಡಿಕೊಂಡು ಸಾಯಿರಿ.ಆದರೆ ಯಾವುದೇ ಕೊಲೆ ನಡೆದಾಕ್ಷಣ ಅದರ ತನಿಖೆ ಮುಗುಗಿಯುವ ಮುನ್ನವೇ ಅದು ವೈಚಾರಿಕ ಕಾರಣಕ್ಕೆ ನಡೆದ ಕೊಲೆ ಎನ್ನುತ್ತಾ ಇನ್ನೊಬ್ಬರ ಕಡೆ ಬೊಟ್ಟು ಮಾಡಿ ಚೀರಾಡುವುದನ್ನು ನಿಲ್ಲಿಸಿ.